After Irma, a Mystery: Where Did Washed Ashore Canoe in Florida Come From? 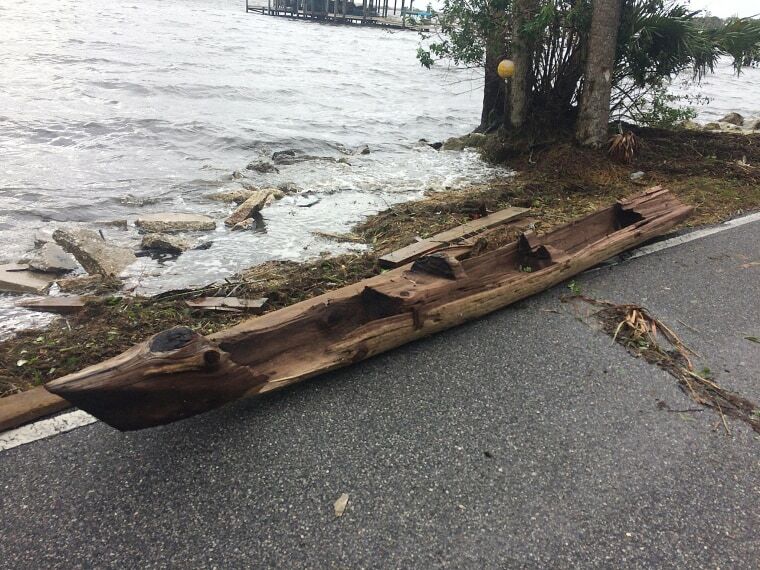 While Hurricane Irma devastated parts of Florida, it may have inadvertently unearthed a hidden treasure potentially centuries old: a wooden canoe that could be hundreds of years old. That's where the mystery begins. Randy "Shots" Lathrop, a fine art photographer, was on a bike ride Monday morning to see the damage that Irma inflicted on his coastal community of Cocoa, east of Orlando, when he discovered the odd object on the banks of the Indian River. He sent an urgent text to a friend who specializes in underwater archaeology, and he responded with equal astonishment. "I didn't believe it. I was shocked," Lathrop said Saturday. "I was happy because it made perfect sense to me that it would end up here. Any time we have any kind of a storm, certain parts of our coastline are just swarming with [people with] metal detectors because they understand that items wash ashore after hurricanes." Lathrop requested that his friend bring his truck to transport the canoe to another location. The narrow boat — 15 feet in length and weighing almost 700 pounds — proved difficult to secure. They struggled with it, not only because of its weight, but also the bad weather wrought by Irma. "In some places, the water was still knee- to waist-deep on the road," Lathrop said. Shortly after Lathrop and his friend successfully brought the canoe home, a field archaeologist came to examine it. While Lathrop doesn't know for sure the origins of the boat, he said, he used to be heavily involved in historic shipwreck salvage and is a history buff. "I think it's potentially early pioneer," Lathrop said. The canoe was made by hollowing out a tree trunk and features square iron nails, he added, which are unusual. "They made them in the 1700s. It could be a hybrid, but I don't know," Lathrop said. "That's why I'm so anxious for the experts to look at it." The state Division of Historical Resources, which was given the canoe to examine, said it is performing carbon dating in an effort to determine the boat's origin. The results could be made available in a few weeks. For now, the canoe is submerged in a water bath for adequate preservation. "Initial assessments suggest the canoe is over 50 years old, which makes it historic in age, but the approximate age of the canoe is not yet confirmed," the division said in a Facebook post Friday, adding, "Overall, its appearance and the presence of a cut nail suggests it is not a pre-contact canoe. In other words, it is maximum several hundred years old and minimum probably several decades old." The division could not immediately be reached for comment Saturday. When Lathrop posted the finding on his Facebook profile, it gained instant popularity: Over 80,000 people shared his photos of the canoe, he said. He was flooded by friend requests, messages and comments. "It's intriguing to the general public because it could have been you or anyone else walking down the road to have the same opportunity. It didn't take a salvage team to get this," he said. "I think it struck a chord." Scholars, archaeologists, museum curators and representatives from Native American tribes contacted him as well to seek more information about the small vintage vessel. The Division of Historical Resources said Florida has the highest concentration of these types of canoes in the world with more than 400 from the state. Lathrop hopes the state, now the canoe's caretaker, will eventually choose to display it publicly in a local museum. "It's in their hands moving forward," he said.